7th CPC: Cabinet approval on Dress Allowance [Washing Allowance, Uniform Allowance, Kit Maintenance Allowance, Outfit Allowance]. 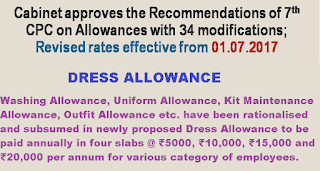 At present, various types of allowances are paid for provisioning and maintenance of uniforms/outfits such as Washing Allowance, Uniform Allowance, Kit Maintenance Allowance, Outfit Allowance etc. These have been rationalised and subsumed in newly proposed Dress Allowance to be paid annually in four slabs @ ₹5000, ₹10,000, ₹15,000 and ₹20,000 per annum for various category of employees. This allowance will continue to be paid to Nurses on a monthly basis in view of high maintenance and hygiene requirements. 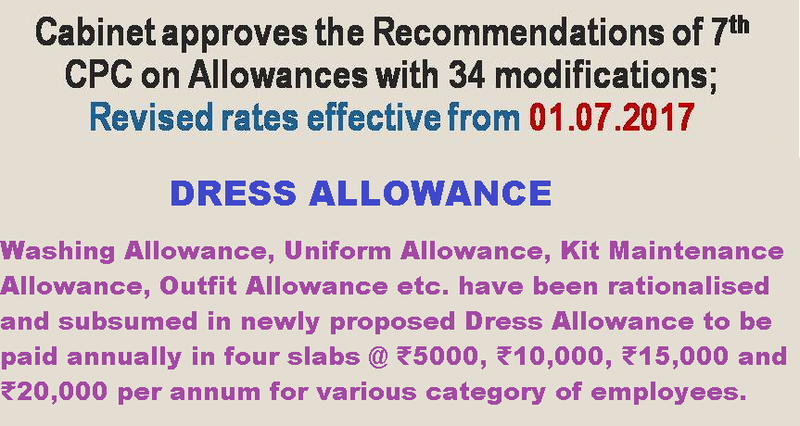 Government has decided to pay higher rate of Dress Allowance to SPG personnel keeping in view the existing rates of Uniform Allowance paid to them (which is higher than the rates recommended by the 7th CPC) as also their specific requirements. The rates for specific clothing for different categories of employees will be governed separately. Washing Allowance, Uniform Allowance, Kit Maintenance Allowance, Outfit Allowance etc. These have been rationalised and subsumed in newly proposed Dress Allowance to be paid annually in four slabs @ ₹5000, ₹10,000, ₹15,000 and ₹20,000 per annum for various category of employees.